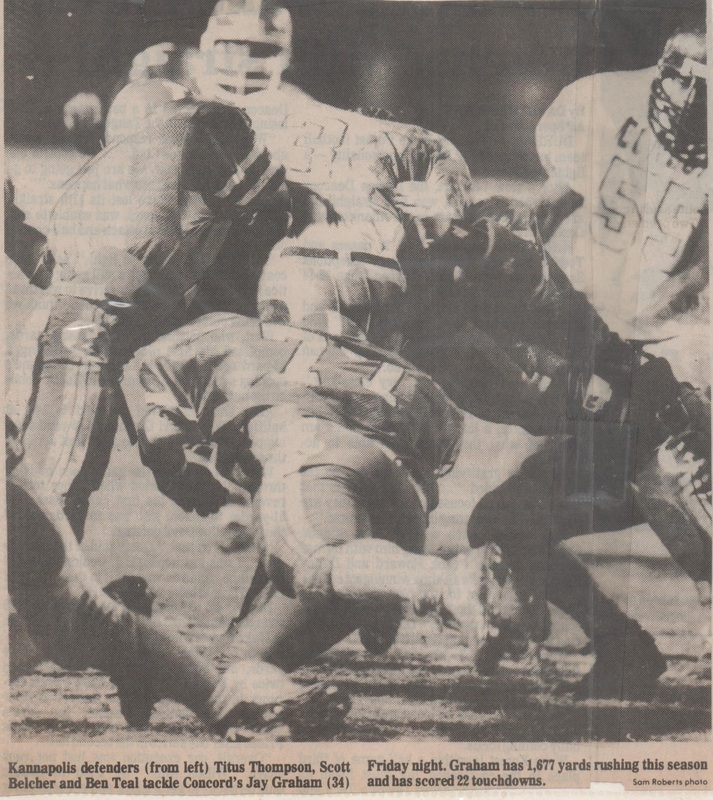 "The 1990 Battle for the Bell"
"The Wonders, 57 Seconds and 70 Yards Away"
After the punt return for a touchdown the remainder of the third quarter saw both teams unable to sustain drives on the other, and the 4th quarter began still deadlocked at seven a piece. With 5:05 left in the game the Spiders had driven the ball from their own two yard line just inside the Wonders ten at the eight, but were denied points after three touches. On a night of calculated gambles for the Spiders coach E.Z. Smith took the ultimate gamble, and facing 4th and six decided to go for the touchdown rather than a field goal. QB Kenny Robinson took the snap and hit Clint Bost out of the backfield between the linbackers for six points. The gamble worked. The PAT would be no good and this turn of fate would come back to haunt the spiders. With 3:15 left in the game Spider QB Kenny Robinson finds daylight on the left side and bolts twenty seven yards untouched to put the Spiders in firm control (Or so they thought) of the game 19-7. Spider coach E.Z. Smith would opt to go for the two point conversion, but the attempt failed. On the ensuing kickoff the Wonders began the offensive series in lack luster fashion as Wonder back Michael Barnes would get the ball and be stacked up at the line of scrimmage by the Spiders defense. The Wonders would now face second and long with just 2:23 remaining on the clock needed something big to happen, and happen quick because time was not on their side at this point. Bruce Hardin called for Maurice Blakeney to go for it all on a fly route to the visitors sideline. The Spiders went man to man on pass coverage which was just what Blakeney wanted. 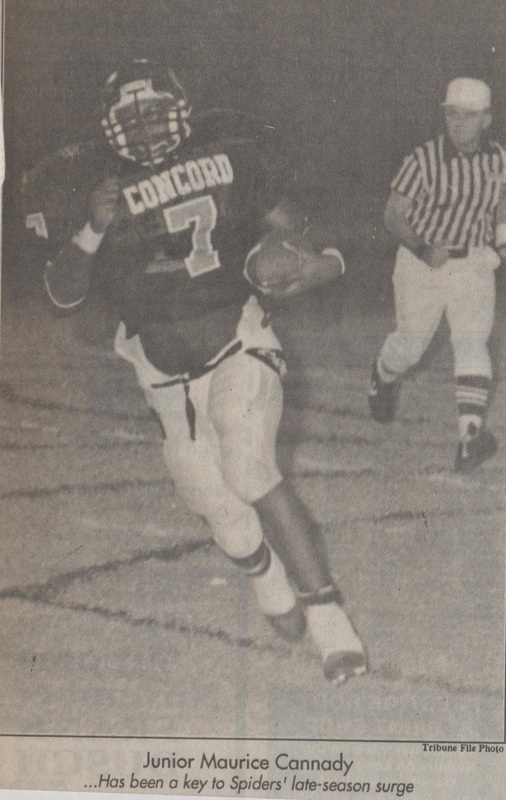 Blakeney loaded up, and fired the ball to Wonder receiver Zra Lipscomb who was able to get space between he and the Concord defender who never looked towards the ball. 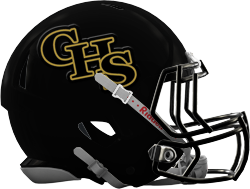 Lipscomb hauled the pass in and traveled the remaining twenty yards to the end zone that brought the Wonders within six of the Spiders again. "Hold the Phone"
Now to make the miracle finish even a possibility the Wonders defense were now looking at the daunting task of making the Spiders, and their powerful quick strike offense go three and out to give Maurice Blakeney and company one last shot at making history. The Wonders defense was exhausted after going three and a half quarters toe to toe with the Spiders big offensive line, but had now found new life for one more stand. Beginning the series with just two timesouts remaining and 2:11 on the clock the Wonders were now looking at the very best making the Spiders go three and out leaving maybe 57 seconds for the offense to get something done. Mission accomplished. 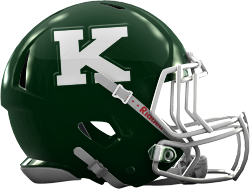 After the Spiders went three and out Kannapolis would use their last remaining timeout to set up for the punt return. Maurice Blakeney had to back pedal from a very nice Concord punt that rolled out at the Kannapolis thirty yard line. The Wonder were oficially "57 seconds and 70 yards away" from the miracle they needed. On the Wonders first play from scrimmage Blakeney would drop back to pass, drop the ball, and pick it up, then scramble out left with Spider defender David Damon in hot pursuit before hurling a 47 yard pass completion to WR Scott Jordan who was sitting patiently between the Concord defenders wide open at the Spider twenty three yard line. The Wonders out of timeouts had to hurry back to the ball to get another play off. Clock winding just under twenty seconds left in the contest Blakeney completes a rather pedestrian pass to Barry Lipscomb who had bent out into the flats then fought his way thirteen yards to the Spider ten picking up a first down which was the game saver. Had the first down not been obtained there was no way the Wonders would have had enough time to get another play off. Seven seconds left the Wonders hurry to the line with one second showing as the ball gets snapped. Blakeney gets immediate pressure up the gut from Spider defender David Damon and Dino Miller, and has to scramble for his life towards the southwest corner of the west end zone. There in the endzone waited WR Scott Jordan surrounded by Spider defenders. Blakeney fires the ball up in the air as he is being brought to the ground by Dino Miller. (Concord fans are already beginning to storm the field on the north side of Memorial Stadium) The ball is tipped by Spider DB Pat Tierney as Jordan is beginning his fall out of the end zone. As the ball comes down it falls into the out stretched hands of Jordan whose feet are the only remaining body parts in bounds, and the miracle in K-Town is now reality. Pandemonium overtakes the Wonder sideline. Fans Storm the field. Dejected Spiders stand gazing in disbelief. Some on the ground crying and some too angry to stay on the field. The dagger that had been put in the heart of the Wonders with 3:15 left in the game had suddenly been pulled out, and stuck straight through the heart of the Spiders denying them an SPC Championship and the bell. This game would be a hard pill to swallow for the Spider faithful to this day. Enjoy what has become known as the greatest fifty seven seconds of football in Cabarrus County. 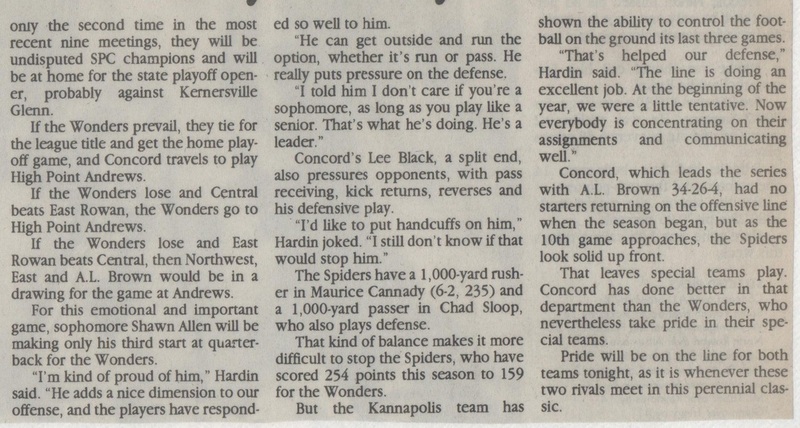 "Coach Hardin Gives His Take on the Bell Game of the Decade"
"Just as it Happened, According to"
"The 1991 Battle for the Bell"
In 1991 the Wonders and Spiders hooked up at Robert C Bailey Stadium for the 61st playing of the Battle for the Bell. To this point the Spiders had dropped four straight games to the Wonders with the last loss being a very tough pill to swallow for the Spiders. The Spiders would come away from the 60th battle losing on a miraculous fifty seven second, 70 yard drive by the Wonders to win in the final second at Memorial Stadium. 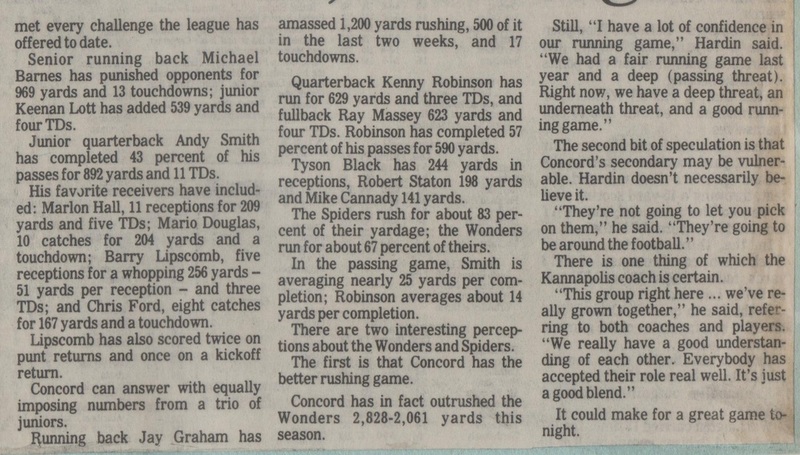 This year still stinging from the 1990 loss the Spiders would unleash what would come to be their biggest offensive weapon in one Jay Graham. Graham a future Tennessee Volunteer would have a break out game that night which cost the Wonders the Bell, and the SPC Championship losing 30-20. The first points of the night would come off this fine Ray Massey run for 51 yards, and a touchdown putting the Spiders up early 7-0. 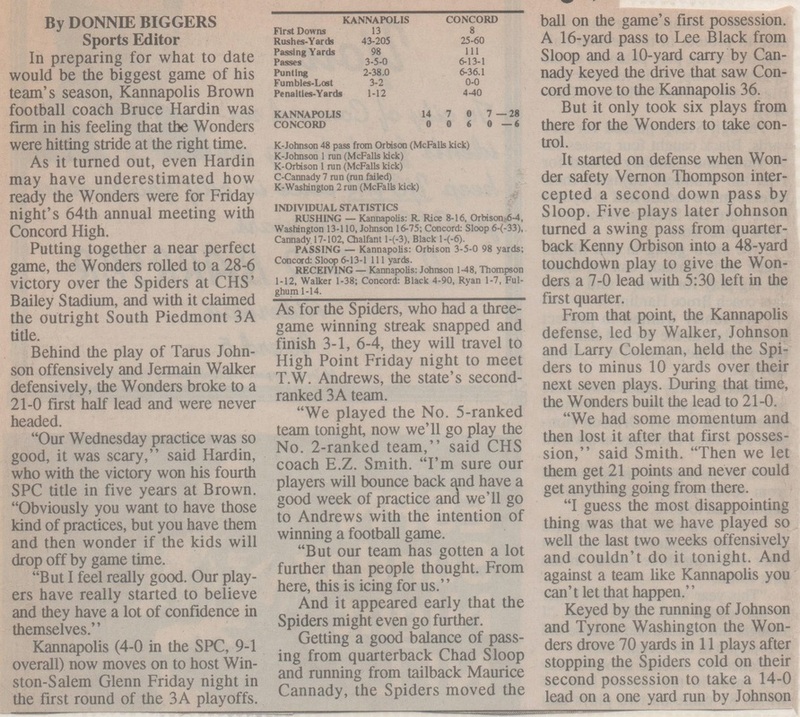 After the Wonders recovered a Kenny Robinson fumble inside Spider territory the Wonders would travel twenty one yards in six playes for a Michael Barnes touchdown that evened the game up at seven a piece. The Wonders defense would have their hands full the rest of the evening trying to contain Graham to no avail. With 7:38 left in the first half the Spiders would again take control of the game, and the lead with this Jay Graham 25 yard touchdown plunge that set the tone for the Spiders for the remainder of the game. The game would now begin to swing in the Spiders favor. With 1:55 left in the first half Jay Graham would give the Spiders a two touchdown cushion the Wonders would never recover from. Graham behind textbook blocking broke off this sixty yard touchdown run that left the Spider faithful believing revenge would be theirs this night. After the Wonders took the opening kickoff of the second half just inside Spider territory, Michael Barnes would break off this forty yard touchdown run to put the Wonders back in the game at 21-13. A missed PAT by the Wonders left the score at thirteen for the Wonders. Concord would fail to convert on third and long and punted the ball back to the Wonders pinning them inside the one yardline. The Spider defense would rise to the ocasion stuffing Michael Barnes in the Wonder endzone for the safety making it a 23-13 affair midway into the 4th quarter. With ten seconds left in the third quarter the Spiders would put the final nail in the coffin on this four yard Jay Graham touchdown run that put the Spiders in comfortable control 30-13. A little too late. Wonders score with just 1:20 left on the clock to bring the score to 30-20 where it would stand after a failed two point conversion, and a unsuccessful onside kick attempt. 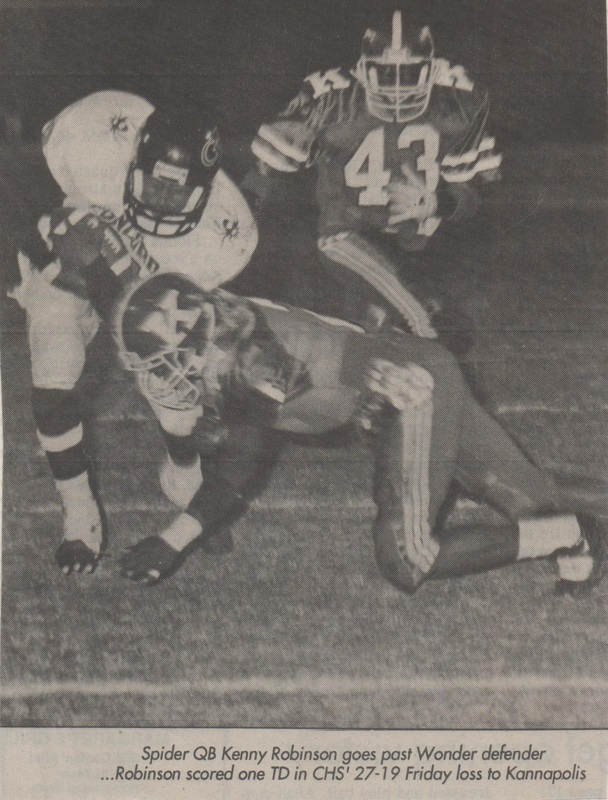 In a scene that is never easy to do Wonder Captain Grady Hardeman had the dubious task of dragging the victory bell over to the Concord side of the field. for the 61st bell game. 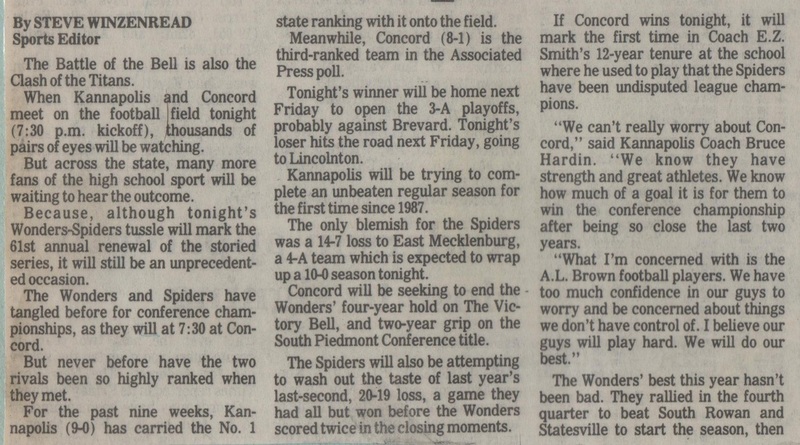 The Wonders would exact revenge against the Spiders just four weeks later in the Western Regional final denying the Spiders a chance to play for a state title that year. 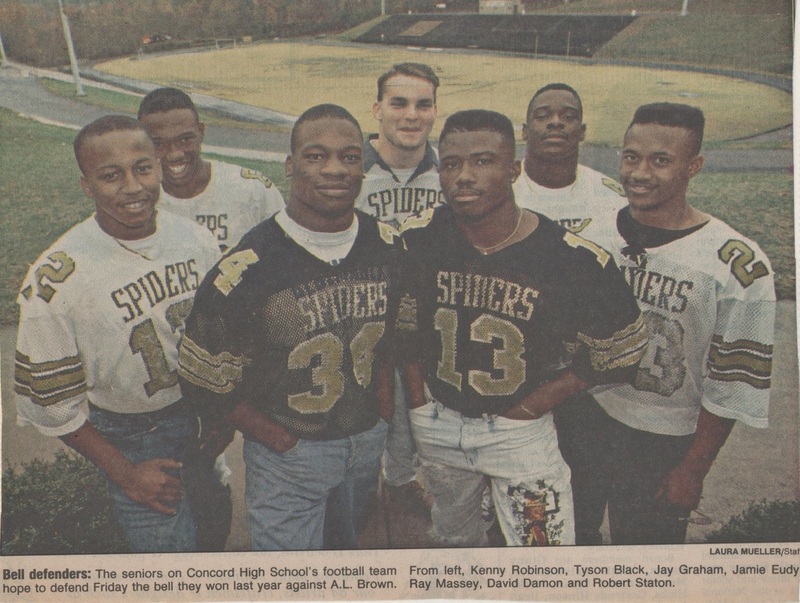 "The 1992 Battle for the Bell"
In 1992 the Wonders and Spiders hooked up for the 62nd Battle for the Bell at Memorial Stadium in Kannapolis. 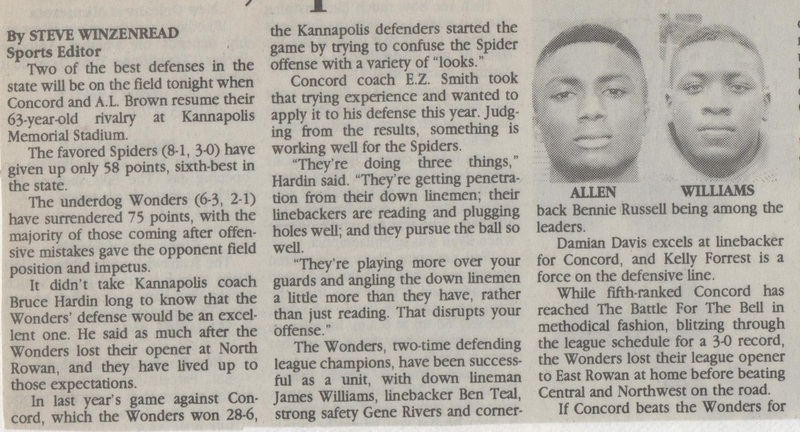 This night the Wonders were dead set on avenging a 30-20 loss to the Spiders the previous year in Concord. The Spiders had been riding the legs of Jay Graham since 1990 and this year would be no different. In the beginning the Wonders and Spiders looked as if they would exchange blows for most of the night. The Wonders were able to score on time consuming drives while the Spiders were quick to answer usually on big runs from Graham. Tonight's battle would come down to costly turnovers for the Spiders. 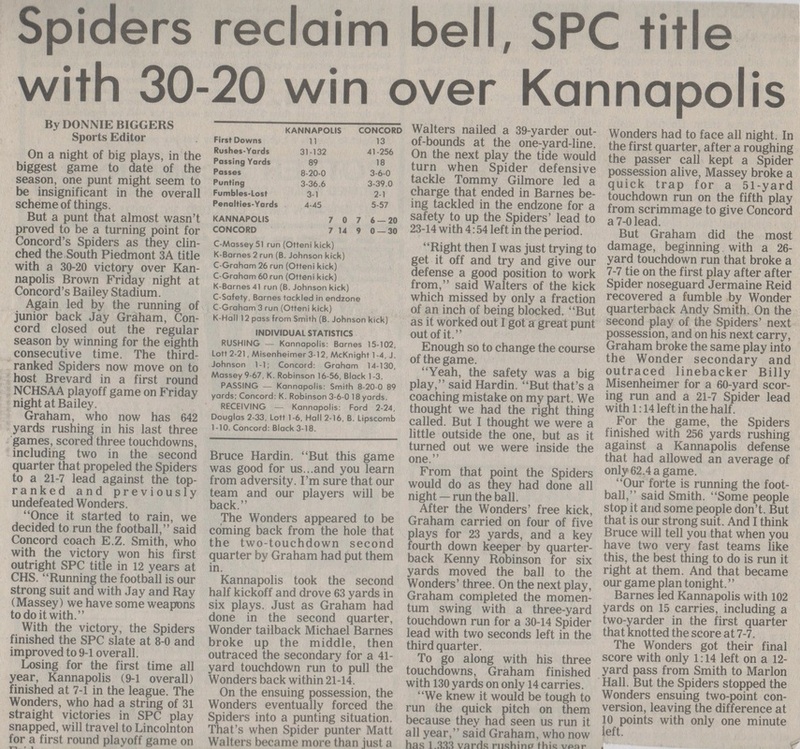 The Spiders would draw first blood after taking the opening kickoff, and sustaining a five minute fifty eight second drive deep into Kannapolis territory. On 3rd and five Concord QB Kenny Robinson would option out left keeping the ball and scoring a five yard TD run to put the Spiders on top the Wonders 7-0. With 11:58 left in the first half the Wonder would make a new ball game out of the deal with this two yard plunge for a touchdown by Keenan Lott. 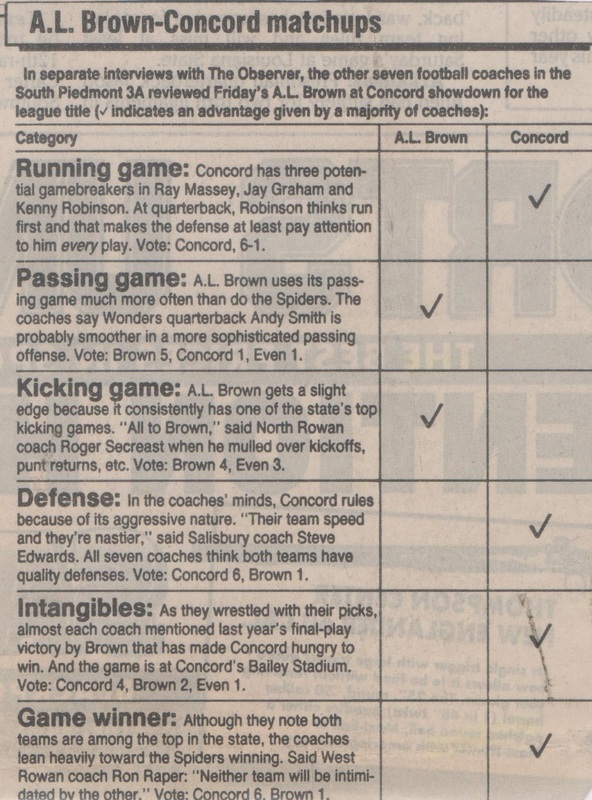 The Wonders were utilizing ball control to their advantage, but Concord was grabbing yardage in big chunks. With just under ten minutes left in the first half the Spiders would go back out in front again a five play eighty yard drive that culminated in a 30 yard Jay Graham touchdown. Graham would bust this score up the middle and go untouched to the end zone. The PAT would be no good and the Spider would lead 13-7. The next Wonder score would come courtesy of a rising star at halfback. 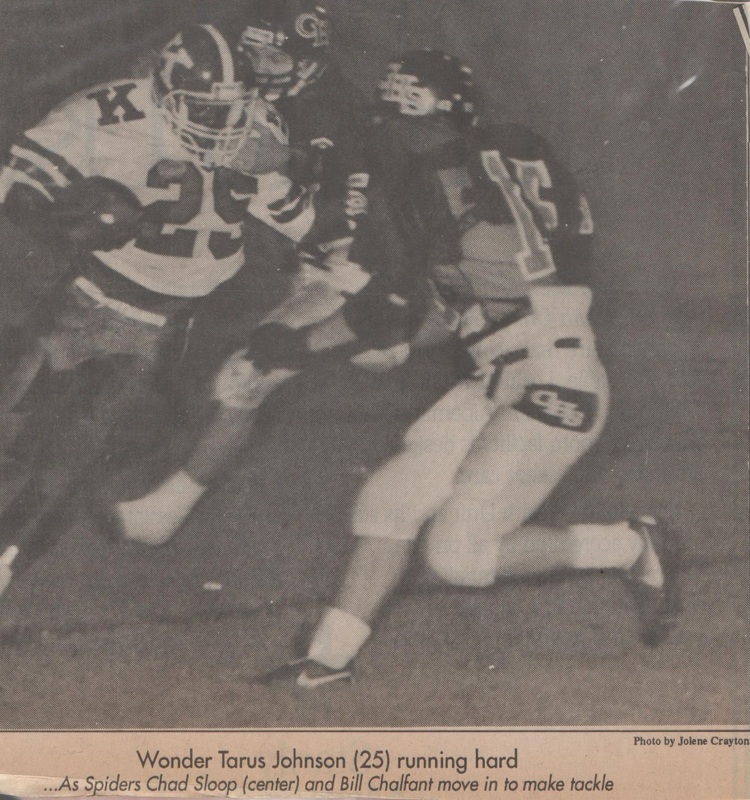 #25 Taurus Johnson would score on a five yard touchdown run after a perfectly executed seven play sixty three yard drive that put the Wonders back in the lead 14-13 with 6:30 left in the first half. The lead wouldn't last long. After the ensuing Wonder kickoff it would only take one play from scrimmage for the Spiders to jump out on top once again. Jay Graham would take a hand off from Kenney Robinson off tackle and gallop 74 yards to paydirt breaking the Wonder spirit in one play. The Spiders would attempt a two point conversion to no avail. Spider would lead going into the break 19-14. After the Wonders were stopped at the one yard line before the break by the Concord defense. The Wonders would receive the opening kickoff to start the second half. Kannapolis would drive seven plays and sixty three yards chewing up three minutes. The score would come after Wonder QB Andy Smith handed the ball off on a delay to Keenan Lott who scrambled from seven yards out for the touchdown. The PAT would be no good and the Wonders would lead 20-19. The turning point in the game would come on the ensuing kickoff. Spider return man would muff the kick at the Wonder eleven yard line which was picked up by the Wonders. Wonder runningback Keenan Lott would score the final points of the evening from two yards out putting the Wonders out in front for good. 27-19. As the final seconds tick away all the Spiders can do is watch the bell and the 1992 SPC title walk away from them into the hands of the Wonders. This would be one of the better bell exchanges. 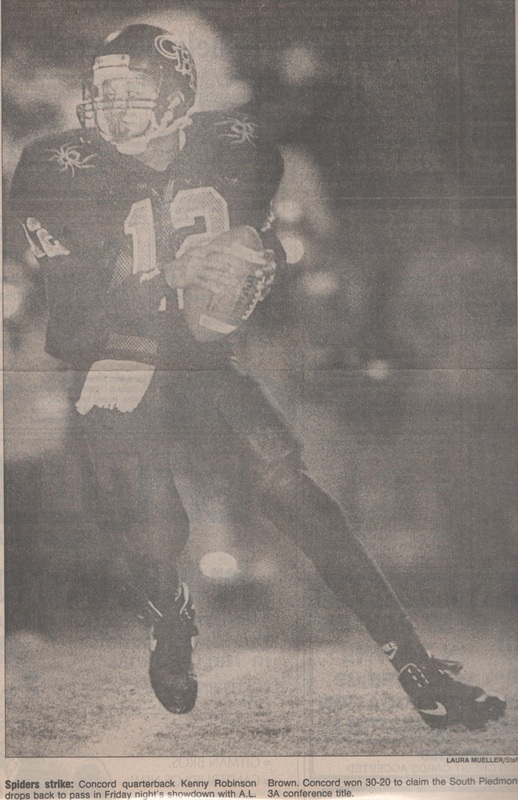 "The 1993 Battle for the Bell"
After defeating the Spiders at Memorial Stadium in 1992, the Wonders looked to keep the string alive taking a very young team into Bailey stadium for the 63rd meeting between the two schools. 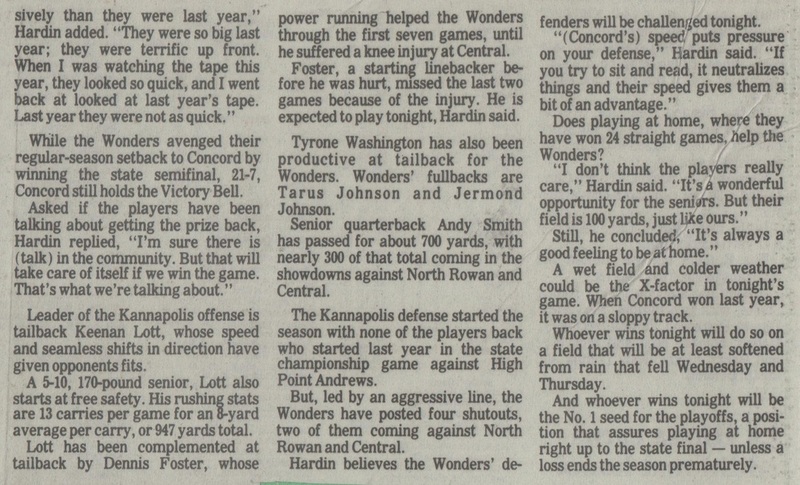 The Wonder offense was led by QB Kenny Orbison who had some terrific weapons in Taurus Johnson, and Tyrone Washington. The Spiders on the other hand would introduce a new runningback who would become the bread and butter of the Spider offense in Maurice Canady. It was obvious that the junior Canady would soon become a key component in the Spider offense. The first points of the evening would come courtesy of Taurus Johnson as he found separation between himself and the Spider defender making the catch and blitzing down the right sideline 48 yards for the touchdown. Wonders would go up 7-0 early in the first quarter. With eleven seconds left in the first quarter the Wonders would strike again on 2 and 1 from running back Taurus Johnson. The PAT would be good and the Wonders would take a quick 14-0 lead going into the second quarter. Quarterback Kenny Orbison would call his own number on this three yard touchdown keeper as the Spider defense left the middle of the field wide open. The Wonders would bolt out to a 21-0 lead over the Spiders with 4:54 left to go in the first half of play. With 10:15 left in the game the Spiders would finally get on the scoreboard after a Wonder turnover put the Spiders in striking distance at the Wonder fifteen yard line. Two plays later Spider running back Maurice Canady would bowl over several Wonder defenders enroute to the end zone from seven yards out. The PAT would be no good and the Wonders would now lead 21-6. The final seconds tick away in the 63rd battle. The Wonders would keep the bell another year, and there would be no exchange this go around. Basking in a 21-6 victory over the Spiders at Bailey Stadium Larry Mason talks with TV-13 Player of the game Taurus Johnson, and head coach Bruce Hardin about the win. 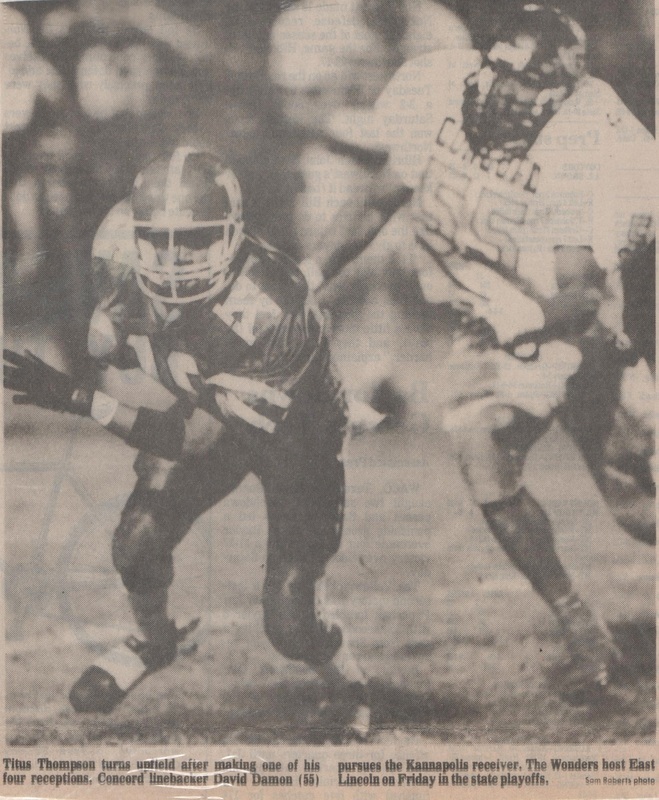 "The 1994 Battle for the Bell"
In 1994 the 64th Battle for the Bell game would find the Wonders looking to extend their victory streak to three games. As usual Memorial Stadium was packed to capacity, and from the beginning it looked like the Wonders were poised to make the game an offensive spectacle. Concord would come into the game with offensive weapons all over in QB Chad Sloop and RBs Maurice Cannady and Cody Robinson. The first score would come on the second play from scrimmage as QB Shaun Allen optioned left and pitched out to Bobby Lawson who almost muffed the catch, but exploded seventy yards for the touchdown. Wonders would go up 7-0 with 10:53 left in the first period. 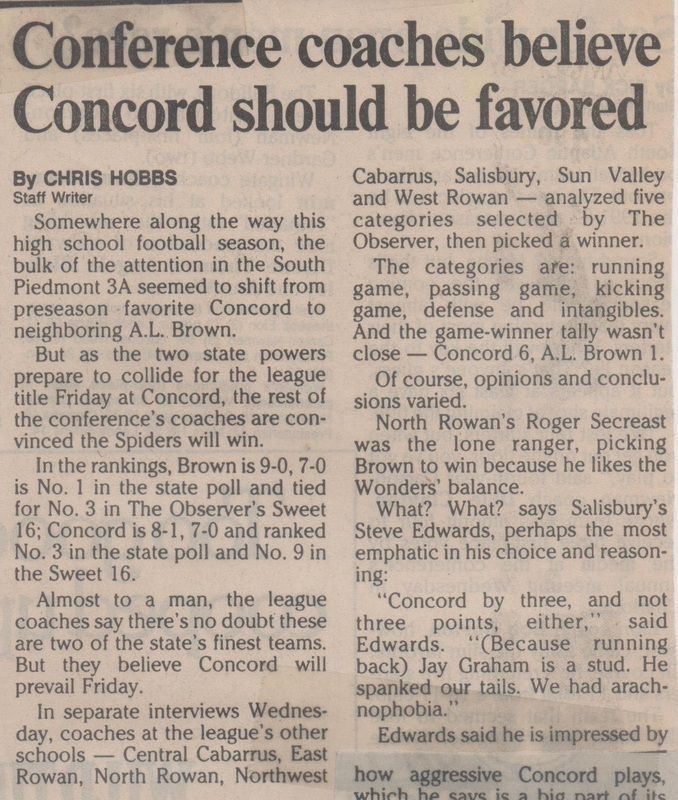 On Concord's first possession they were not about to be outdone. Spider QB Chad Sloop optioned right keeping the ball, and scampering fifty five yards untouched for the touchdown. The PAT would be blocked, and the Wonders would lead 7-6 with 8:54 left in the opening period. With 10:00 left in the second quarter Shaun Allen connected with Deron Ford on this seventy nine yard touchdown pass that put the Wonders up 14-6 on the Spiders. Things were looking good for the Wonder offense, but this is where things would begin to go South down 29 for the Wonders. Spider QB Chad Sloop connects with Marty Barnhardt #12 on this post route that put the Spiders in scoring position at the Wonder one. A mistake was made on the reciever who caught the ball by the color men from vision cable. They said it was John Fulgham who caught the pass when in reality it was Marty Barnhardt. Two plays later on second and goal Cody Robinson would take it in from one yard out to put the score at 14-13. 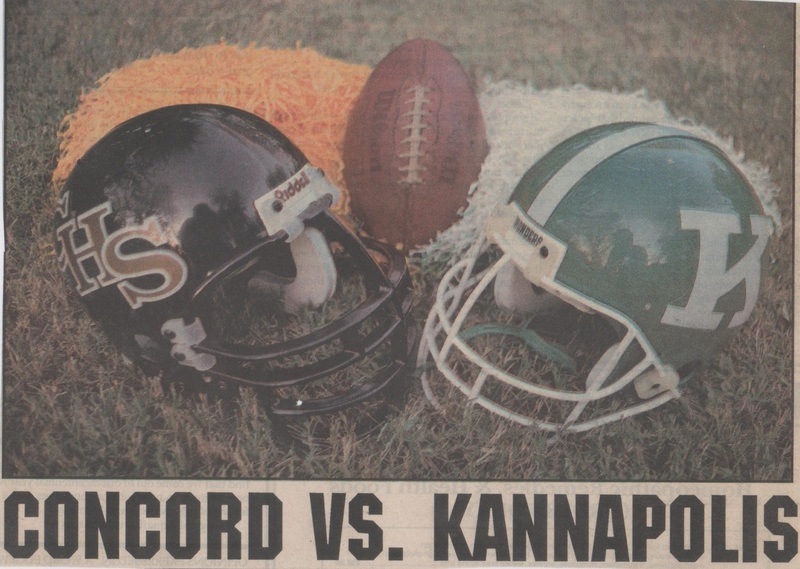 Concord would go for the two point conversion with Sloop connecting with #11 John Fulgham deadlocking the game at fourteen with two seconds left before the break. After a personal foul put the Spiders in striking distance in the red zone Chad Sloop options left, and pitches the ball to Maurice Cannady who takes it in from eleven yards out to put the Spiders up 21-14 after a nine play sixty five yard drive. The game would now swing in the Spiders direction. On a fourteen play eighty eight yard drive the Spders would again find themselves in striking distance from the one.With first, and goal QB Chad Sloop calls his own number on this QB Keeper putting the Spiders up 28-14 with 8:30 left in the game. The final score of the game would come with 3:10 left in the game on this four yard touchdown run by Cody Robinson that sealed the Wonders fate 35-14. The Spiders would chew up sixty nine yards on eight plays. Concord runs the clock out, and takes home the 1994 SPC Championship and the victory bell. A hard time for Wonder fans, but better days would come.